We've combined function and style for the perfect wine accessory kit. Inside you'll find an ergonomic corkscrew designed for a comfortable grip and effortless turn each time you open a bottle. It has a 2-inch handle for an easy grip and to open bottle cap seals. Also included is a ball style wine bottle stopper with a silicone middle to tightly seal off any bottle and keep your drink fresh. This kit comes in a hardcover storage box to keep it in good condition without rusting or breaking for years to come. This set is the perfect present for those people in your life that are hard to shop for. 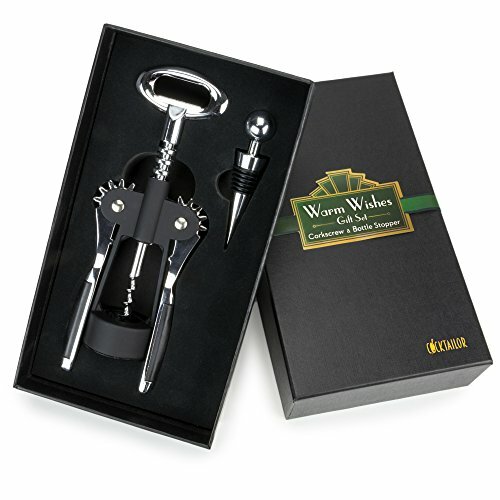 From wine connoisseurs to bartenders, this kit is ideal for holidays, housewarmings, and home bar stations. This Warm Wishes Gift Set is an ideal present for those cherished moments. Put it to use for cocktail parties, romantic dinners, or a night at home. You'll find it opens your wine bottles with ease. Now that's something to toast to. If you have any questions about this product by Cocktailor, contact us by completing and submitting the form below. If you are looking for a specif part number, please include it with your message.